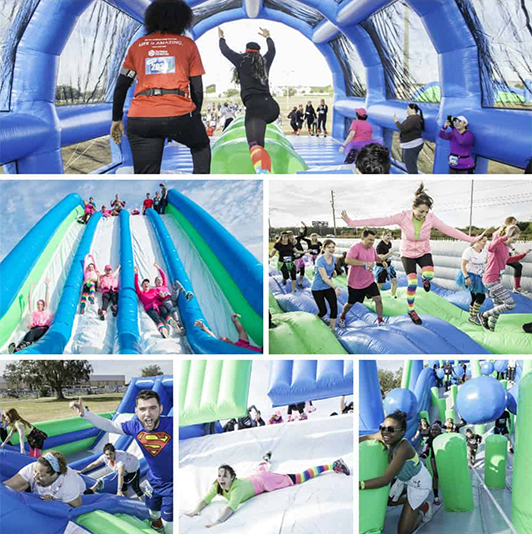 Thanks for your interest in the Insane Inflatable 5K, a new dynamic and extreme obstacle race, made up solely of inflatable obstacles. It will challenge participants, surprise them, and leave them bouncing back for more! We didn’t just throw together a couple slides and bounce houses – we took imagination, creativity, and a collection of notes on bar napkins, and went to the leading manufacturer of custom inflatables. We told them to throw out the rulebook and go INSANE! If you would like more information about the Insane Inflatable 5K, please feel free to reach out to us. Our logo along with photo and video that you are free to use for editorial purposes are provided via DropBox; please credit Townsquare Media.